Vintage Kitchen Chair Tutorial - How to make a metal tubular kitchen chair, 1 inch scale. This is the chair from the Vintage Kitchen, I have several pictures of this room box on the blog, one picture is in the July 29, 2009 posting. I've been asked to make a tutorial for this chair several times, I avoided it because it's tricky. Even now, when I made the samples for you I held my breath when the bending began. I didn't have another piece of aluminum if this failed. I am making the table next month so you will have a matching set. This set is in my full-size kitchen, so I took the measurements from it and converted to 1 inch scale. This chair uses 3/32 inch aluminum tubing. I used to get it from Micro Mark, they only sell by the box of 15 now, at least that's what their web site listed. Now, if your first try at bending this chair is successful, consider yourself lucky, but 15 pieces is way too many unless you are using this as a club project. I have found a site that sells the K & S Engineering aluminum tubing in smaller amounts, www.hobbylinc.com They sell 3/32 inch aluminum tubing in a package of 3 for 1.59, I would purchase 2 packages, just in case. For the table you will need 1 package of 1/16 inch aluminum tubing, 6 pieces for 1.59 and 1 package of 1/8 inch aluminum tubing, 3 pieces for 1.89. Look under "building supplies". Of course, if you have a hobby shop that specializes in models and trains they might have this tubing. I used basswood for the seats and backs on the original chairs. If you have access to a scroll saw and can cut the wood, I would use the wood. The seat is 3/32 inch thick basswood and I sanded the saddle into the seat. The back is cut from 1/16 inch thick basswood. After I cut out and sanded the edges round I dampened the back and let it dry over a glass, something that had the right size bend. I held it in place with rubber bands. Let this dry overnight. Then I painted with Rustoleum white oil base paint. 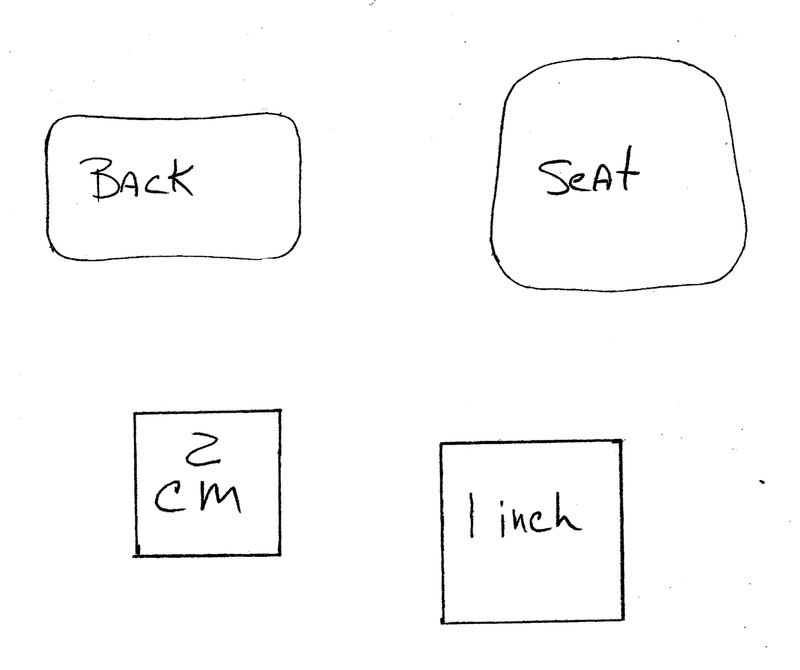 For this tutorial I am using mat board for the seats and backs. I mentioned earlier, if you are successful on the first try consider yourself lucky. This goes fast, you'll have a chair in no time, if your bends are correct. Don't try to move the bends too much, aluminum only bends once. I don't use the "tube benders". They are more trouble than they are worth. We will make a bending jig. You'll need a scrap of wood, a piece of a 2 x 4 or maybe a piece of plywood, at least 1/2 inch thick. On a piece of paper draw your chair shape. Use a square. 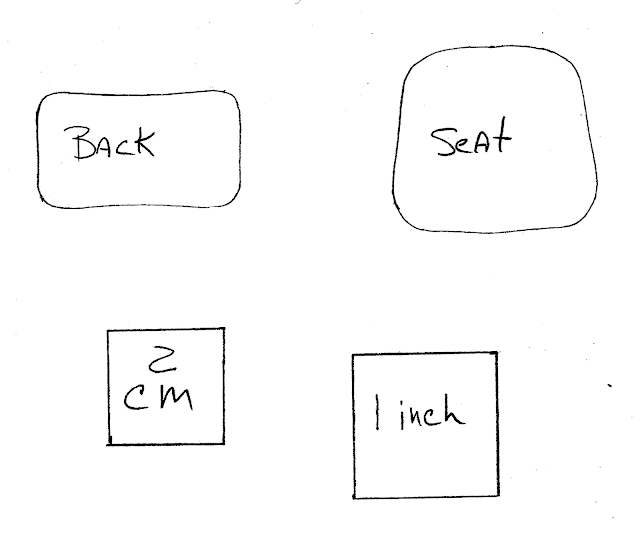 From top of back to seat is 1-1/4 inches; back of seat to front 1-1/4 inches; top of seat to floor 1-3/8 inches and the last measurement is 1-1/16 inches. Now, round off the corners, I did this freehand, if you want to use a circle template, go ahead. Cut this pattern out and glue it to your scrap of wood. Next, you are going to need some brads. These are small nails with NO heads. Mine are probably 5/8 inches long. The picture above is my original bending jig from maybe 10 years ago, never throw out your jigs or forms, you will need them again. See the little brads? Yes, they look like nails, but you can't have heads on them or you won't be able to get the tubing off after you've bent it. Carefully hammer the brads into the wood on your rounded lines. Do you see how mine are very, very close together? You have to do this so the tubing won't crimp. This is your first bending jig for the chair, you have one more to make. On another piece of paper draw an "L" with your square, each leg is 9/16 inches long. Round it's corner also. Glue this piece to the scrap of wood also, glue it about 10 or 12 inch away from the first pattern. Carefully hammer the brads onto the rounded line. Again, this is my original jig with all of my notes. You see I made some mistakes the first time, and when you see me bending you will notice that I had the two jigs too close together. To keep the tubing from crimping insert a wire large enough to fill the inside of the tube. I had 18 gauge covered wire on hand. I had to unravel the thread on it, but it fit into the 3/32 inch tubing just fine. The tubing is 12 inch long. Use your craft knife and with the wire inserted, cut the tubing to 11-1/16 inch. I am cutting the tubing. Cut the wire a little shorter than the tubing. Straight pins are used to cap the ends of the tubing so we need room for those. We are ready to bend. Hold the tubing at the top of the jig, the tubing is going to want to move away from the brad, hold onto it. Please forgive the picture quality, I had help. I've made the first bend at the back of the seat. THEN, I moved the tubing so that it is on top of the second bend's brads, look carefully and you can see this. In this picture you can see how I moved the tubing to be on top of the second bend. I've made the bend and I am down to the bottom. I've made the third bend. I am marking on the tubing a line to indicate the end of the pattern. I've removed the chair and now it's on the next jig. The mark you made should be at the first brad. This is a picture from the top and I am bending around the brads. I am marking the tubing again indicating the end of the pattern, this is also the center back. At this point you could cut the chair at the center back, it's much easier this way, but you have a seam that would have to be glued. Can you see the chair on the right, the center back line is matching the one on the pattern? We are still looking at everything from the top. I've made the second bend for the bottom of the chair. I do not know how to explain this, but here goes . . . take a straight edge, your ruler, but it's got to be flat and thin, that's why I have mine turned over, push it against the curve and make a mark on the other side of the chair's tubing. This is not exact, this is going to be your trial chair. Remember, you can cut the chair at the center back. I've gone back to my first jig, see the chair is standing up on it's bottom. I've lined up the mark I made with the first brad. After I made the first sample chair, I found that I needed to move the chair back, maybe a 1/16 inch from the brad. We are still looking from the top. The back bottom of the chair is on the left and I am beginning the bottom bend. Yes, it's not on the same plane, we are going to twist the second side into position. Are you sure you wanted these instructions? I've continued around the brads. REMEMBER, to move the tubing after the second bend so that it's under your brads at the back of the seat. If all went well you should be ending at the beginning mark on your pattern. Carefully lift your chair off of the jig. Carefully twist the other side of the chair into position. You have one try at this. Here are my two samples, and my original chair. You can move the aluminum tubing a bit, but don't worry it to death, it will break. All of this just takes minutes to do. Transfer the patterns at the top of this posting to a program that you can change sizes in. When you get the 1 inch square to measure 1 inch, you have the patterns correct. As I mentioned earlier, if you have basswood and can cut it, use it. If not we are going to use mat board for this tutorial. I bent the chair back using a form, this is a circular Altoids tin. Wrinkles will appear on the surface of the mat board. To cover them, because it very hard to get rid of them, cut a piece of paper or card stock to fit over the front of the back after it's bent. This should be a lot easier than trying to sand and paint them out, like I tried to do. Glue the paper with yellow carpenter's glue while the back is in it's bent position. Hold until set. Find some straight pins with large heads, or you can punch circles to cover the open ends of the tube. I had some small nails I used for the samples. I sanded the edges half round and then gave everything a coat of Delta's PermEnamel Gloss Glaze to seal. A picture showing the half rounded edges. I painted the mat board with Delta's PermEnamel white paint, several times, sanding with 320 grit paper in between coats. We are trying to imitate metal so we want a very smooth surface. After you are satisfied with the surface give everything a coat of Delta's PermEnamel Gloss Glaze. I glued the backs and seats on with instant glue, be careful of your position, you don't have much time to reposition. Yes, this chair is a little daunting, but you can do it, just take a deep breath!! I will be posting the table next month. Have fun, expand on it, make it better, Just keep making MINIS!!!!! Hello, I have a link I want you to go to. This link is to a talented lady's pictures, pictures of things she makes. Gail bought my Retro Set and then she made the perfect tables and lamps to go with it. Look at her album, she is considering setting up "shop" and selling her accessories and she needs some encouragement, folks. She makes all kinds of things and they all look fantastic! !